Fall is here! Well…kinda…sorta…almost…spiritually…uh, whatever. 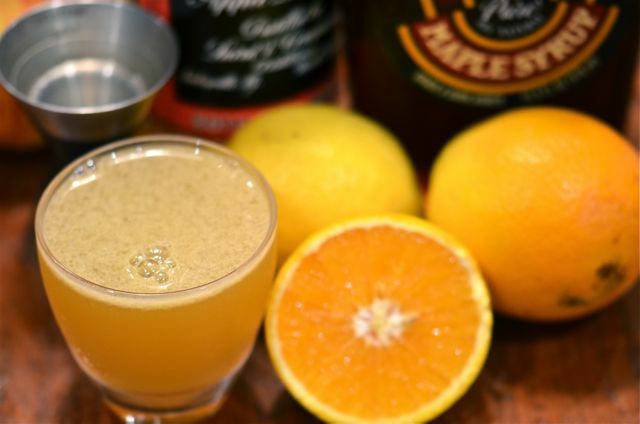 Labor Day is gone, the kids are back in school, and now we feel free to post “fall-themed” cocktails. And when we think autumn, we think apples. And if you like eating (and drinking) with the season, there is nothing quite like Applejack, the great American brandy. And there is no better Applejack cocktail than the Applejack Rabbit. Unfamiliar with Applejack? It is the first great American spirit. Way before Americans fell in love with whiskey, we turned our apples into cider and then let that cider turn to apple brandy. How? In the “old” days of the 18th century thirsty Americans would leave out their “hard” apple cider in winter, and as it froze they would remove chunks of ice. The ice was mostly water, as the alcohol has a lower freezing point, so what was left over became ever-stronger apple brandy. And it was usually potable, but quality could be spotty (and perhaps just short of lethal). 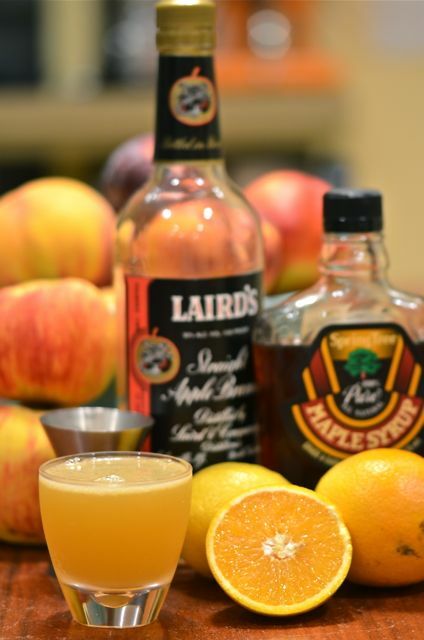 Laird’s “Bonded” Applejack, really good stuff. But soon enough, American’s started to distill their Applejack and it has been a consistently tasty, tangy brandy ever since. And as late as the 1920’s, Applejack was a popular cocktail spirit. But prohibition almost killed Applejack distillation. Only Laird & co. of New Jersey survived as a real business. And this is somewhat fitting, as the Laird’s distillery, founded in 1780, is possibly the longest continuously operated distillery in the country. And their Applejack is very, very tasty- and affordable. But one quick note, if buying Applejack, you want the Laird’s “Bonded” Applejack- this version is pure apple brandy and will run you between $20-$30. And what you get is a smooth brandy that has the body of bourbon and the apple flavor of Calvados, but with an extra apple “tang” similar to a green apple Jolly Rancher candy (sorry, but that is what it tastes like). Great stuff and you can use it as a substitute for both whiskey and Calvados in cocktails. If you find it, we suggest you add Applejack to your bar, you can use Applejack in Old Fashioneds or in classics like the Jack Rose. You can even use it in apple desserts….more on that soon. Combine all the ingredients in a cocktail shaker with ice. Shake thoroughly and strain into a chilled cocktail glass, flute or coupe’. No garnish. Serve. I loved to read about the history of applejack, pulling the ice out in the winter and the discovery of what was left! Thanks- native and early Americans used to do the same thing with maple syrup to concentrate it…the water would freeze but the sugar would remain. I love fall, so I’m all for starting a little early! I’m looking forward to making some hot bourbon apple cider myself! Maybe applejack would make a good addition to it. Yeah, we are “cheating” a little but couldn’t wait to share this one. I’ve never heard of applejack. But I’m sure I’d like it !! It seems our collective thoughts are turning to autumn…..
It’s good stuff. Calvados would be a good sub and available in the UK..it will be just a bit “dryer” but you can add a little extra sugar or citrus in cocktails and it will be close to Applejack..
🙂 I was wondering about Calvados, I need wonder no more ! This looks delicious–three cheers for ‘almost fall’! Thanks…and we will take the fall and harvest andy way we can get it! 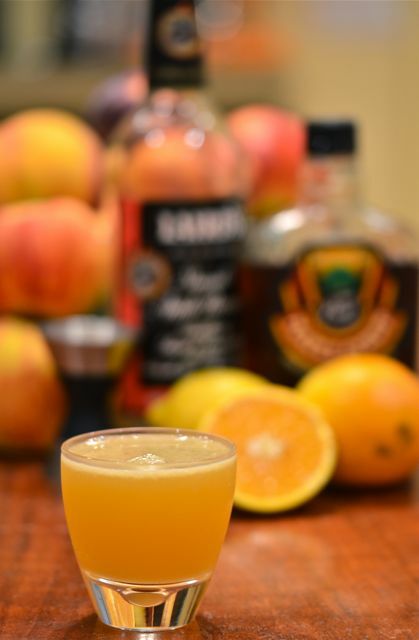 Yep, I’m afraid we have a little while around here before fall settles in… but the drink still looks delicious! 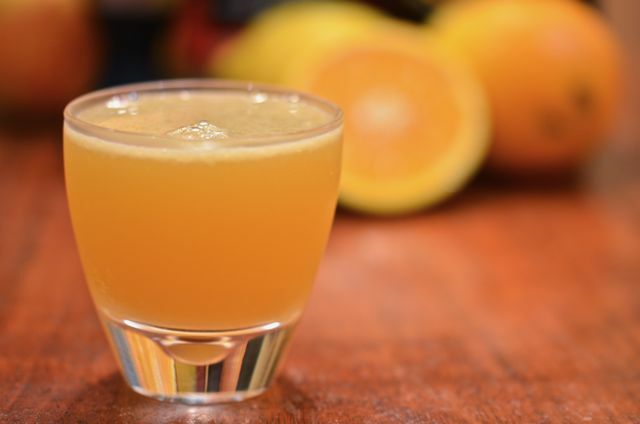 This is a big yes … have some Calvados to use up – like the idea of maple syrup and orange. Will let you know. Hope you like it…Calvados is sometimes a bit dryer/lighter…a touch more syrup or citrus may balance the drink…but have fun playing with it! I will .. thanks for the advice – or I will try it on my best friend with whisky .. she love whiskey. I am looking forward to the autumnal, applejack frenzy! I actually just marked this recipe in the Savoy, and then BAM! Here it is, in that keen Putney Farm vision. We’ll compare notes. Nice post Putney! That sounds like the perfect spirit for the fall. If you’re ever in Seattle, let me know. I have some great recommendations for ya.